Android: Android is a pretty versatile operating system, but it's not really ready for desktop-style uses just yet. RemixOS shows that it could be, with windowed Android apps, running on Intel-based PCs. 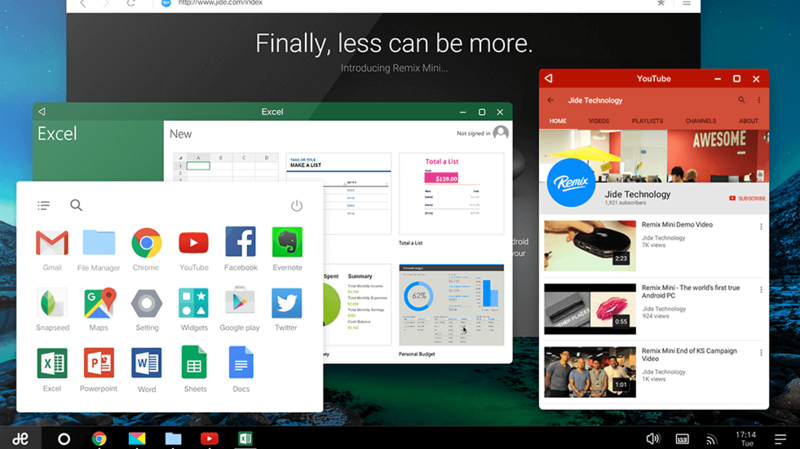 RemixOS is a custom variant of Android with a custom desktop interface that displays Android apps in resizable windows. RemixOS is available as an alpha that can be installed on Intel-based PCs, which includes a few Macs, according to the developer. Of course, Android apps are generally designed for a touchscreen interface, and most PCs don't have touchscreens, so some hardware configurations might have some minor issues. Fortunately, RemixOS allows dual-booting, or booting from a USB key, so if you've wanted to try out Android on a desktop, you can do so with minimal risk.